Comfort and versatility at its finest. The gorgeous 2017 Toyota Camry is stylish, fuel-efficient, powerful, and much more, making it one of the most diverse models on the road. Behind the wheel of the new Toyota Camry, you are sure to turn heads wherever you go. Plus, the latest Camry model comes with tons of convenient amenities that make your time on the road as relaxing and convenient as possible, such as Quiet Drive, the Smart Key System, and more. There are seven different trim levels to choose from when it comes to the 2017 Toyota Camry: LE, XLE, SE, XSE. People will ask, “What kind of car is that?” We designed the 2017 Camry for those who dare to be bold, and with its striking hood lines this is one ride that commands attention. So get inside—it’s time to let everyone know you’ve arrived. With a design just as bold as its performance, the aggressive grille on Camry SE, SE Hybrid and XSE makes one powerful impression. Brighter light. More style. XLE’s available LED headlights help light up the road, and the black sport trim bezels surrounding XSE V6’s LED headlights add the right amount of attitude. And when the sun isn’t shining, available LED Daytime Running Lights (DRL) helps ensure you can’t be missed. Camry XSE comes standard with 18-in. alloy wheels.1 With their gloss-black finish and machined-finish accents, get ready for stares. Good looks and the power to back it up. Camry’s available dual exhaust system has been tuned to provide optimized performance, helping you get the most out of your drive. 1 18″ tires are expected to experience greater tire wear than conventional tires. Tire life may be substantially less than 24,000 miles, depending on driving conditions. Camry SE and XSE put the power at your fingertips with race-inspired paddle shifters. Mounted to the back of the steering wheel, these allow the standard 6-speed automatic transmission to be shifted manually. This system even matches revs with each downshift to help keep things smooth. True performance pedigree is on display with Camry XSE’s available sport leather-trimmed seats that feature Ultrasuede® inserts for maximum comfort. Available red contrast stitching throughout the cabin makes this one thrilling ride. High style. Intuitive control. Camry’s center stack makes it easy to access features like multimedia systems, available integrated navigation1 and available Entune® App Suite.2 And the available dual zone automatic climate control helps give you and your front-seat passenger custom levels of comfort. Whether it’s the sun, moonlit sky or a gentle breeze, Camry’s available power tilt/slide moonroof lets you take it all in. Come on in and get comfortable—Camry has got plenty of room. We sculpted cutaways in the seats and interior panels to help provide more knee and leg room for passengers front and rear. Up top, the headliner was shaped for greater head room throughout the cabin. 1 Availability and accuracy of the information provided by the navigation system is dependent upon many factors. Use common sense when relying on information provided. Services and programming subject to change. Services not available in every city or roadway. Updates may be available from your dealer at an additional cost. See Owner’s Manual for details.2 Be sure to obey traffic regulations and maintain awareness of road and traffic conditions at all times. Apps/services vary by phone/carrier; functionality depends on many factors. Select apps use large amounts of data; you are responsible for charges. Apps and services subject to change. See toyota.com/entune for details. Camry’s standard 8-way power-adjustable driver’s seat with power lumbar support helps you find your perfect driving position. And when the weather gets chilly, available heated front seats will help you stay warm and comfortable. It’s comfort tailored to you. Those passionate about sound will find plenty to love about Camry’s available JBL® GreenEdge™ audio system. Ten speakers in eight locations, plus a subwoofer and amplifier, help keep your music sounding crystal clear. LE and XLE’s spacious cabin features available rich wood-grain-style accents at key touch points to further enhance your driving experience. Keep outside noises outside. Using sound-imaging instruments, we pinpointed where road, wind and engine noise was entering the cabin, then took additional sound-absorbing measures to help create Camry’s whisper-quiet ride. Keep convenience safely within reach. With steering wheel-mounted controls, you’re in command of your audio system and Bluetooth®1 – equipped mobile phone right form the steering wheel. Start it up and go. With Camry’s available Smart Key System,2 you can unlock the front doors and trunk, plus start your car with the push of a button—all without removing the key fob from your pocket or purse. 1 Concentrating on the road should always be your first priority while driving. Do not use the hands-free phone system if it will distract you. The Bluetooth® word mark and logos are registered trademarks owned by Bluetooth SIG, Inc. and any use of such marks by Toyota is under license. A compatible Bluetooth®-enabled phone must first be paired. Phone performance depends on software, coverage and carrier.2 The Smart Key System may interfere with some pacemakers or cardiac defibrillators. If you have one of these medical devices, please talk to your doctor to see if you should deactivate this system. Innovative tech that anticipates your needs. With Camry’s available Entune®; App Suite3 you can access Pandora®4, Slacker Radio and iHeartRadio for music, make restaurant reservations with OpenTable®, and buy movie tickets with MovieTickets.com. Plus, get sports scores, stocks, traffic and weather – even fuel prices. Get where you need to go more easily. Powered by HD Radio™, 5 Camry’s available traffic-monitoring feature provides real-time information on the traffic flow in your area. The available Entune™ Premium Audio with Integrated Navigation6 system can even help predict traffic or suggest an alternate route. It’s easy to stay informed with Camry’s tip information screen. This convenient piece of tech shows your cruising range, average speed, elapsed time, fuel economy history and more. Available advanced voice recognition7 gives you another way to easily access your navigation system,6 Bluetooth®8 hands-free phone and Entune® App Suite.3 All you have to do is speak normally – Camry will understand. Keep track of the driving information you use most with Camry’s standard Multi-Information Display. Easy to view from any angle, this customizable full-color screen shows features like incoming call information, available turn-by-turn navigation,6 current fuel economy, available Dynamic Radar Cruise Control (DRCC)9 and more. 1 Qi wireless charging may not be compatible with all mobile phones, MP3/WMA players and like models. When using the wireless charging system, avoid placing metal objects between the wireless charger and the mobile device when charing is active.2 Be sure to obey traffic regulations and maintain awareness of road and traffic conditions. 4 PANDORA®, the PANDORA® logo, and the Pandora trade dress are trademarks or registered trademarks of Pandora Media, Inc., used with permission. 5 Be sure to obey traffic regulations and maintain awareness of road and traffic conditions at all times. HD Radio™; Technology manufactured under license from iBiquity Digital Corporation U.S. and Foreign Patents. HD Radio™; and the HD, HD Radio, and “Arc” logos are proprietary trademarks of iBiquity Digital Corp.
6 Availability and accuracy of the information provided by the navigation system is dependent upon many factors. Use common sense when relying on information provided. Services and programming subject to change. Services not available in every city or roadway. Updates may be available from your dealer at an additional cost. See Owner’s Manual for details. 7 Advanced voice recognition capabilities vary by head unit. 8 Concentrating on the road should always be your first priority while driving. Do not use the hands-free phone system if it will distract you. The Bluetooth® word mark and logos are registered trademarks owned by Bluetooth SIG, Inc. and any use of such marks by Toyota is under license. A compatible Bluetooth®-enabled phone must first be paired. Phone performance depends on software, coverage and carrier. 9 Dynamic Radar Cruise Control is designed to assist the driver and is not a substitute for safe and attentive driving practices. System effectiveness depends on many factors, such as weather, traffic and road conditions. See Owner’s Manual for details. Camry features a wider track that helps enhance agility and high-speed control. In other words, Camry offers more driving thrills than ever before. So go ahead, seek out those corners. Turbulent air increases drag, which adds wind noise and reduces efficiency. Camry features small, specially placed design features called vortex generators to help smooth things out. Not only do these help Camry maximize its efficiency, they help keep things quiet inside the cabin too. Toyota Camry’s have always demonstrated great value. Over 90 percent of all Camry’s sold over the last 10 years are still on the road today, according to IHS Automotive. What’s more, U.S. News & World Report named the Camry “Best Midsize Car for the Money,” (May 2016) and Kelley Blue Book’s KBB.com named it a “Best Buy Award Finalist”**. The 2016 Camry was hailed as a Top Safety Pick by the Insurance Institute for Highway Safety (IIHS), the 2017 Camry earned a five-star overall safety rating from the National Highway Administration. 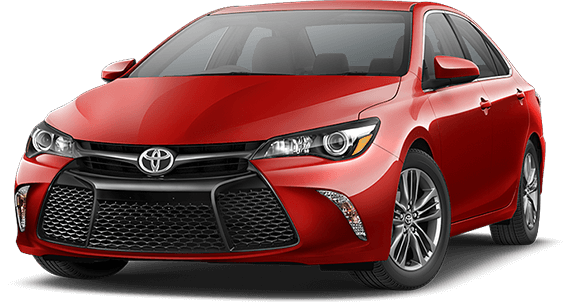 Each Camry comes with ToyotaCare, which covers normal factory scheduled maintenance for two years or 25,000 miles, whichever comes first. See the full list of Awards Here! 2016 Toyota Camry Was Named an Edmunds.com Best Retained Value® Vehicle Winner. 1 View U.S. News Best Cars at http://usnews.rankingsandreviews.com/cars-trucks/Toyota_Camry/2 For more information, visit Kelley Blue Book’s KBB.com. Kelley Blue Book is a registered trademark of Kelly Blue Book Co., Inc.
3 Based on IHS Markit Vehicles in Operation as of July 2016 for Model Years 2007-2016 vs. Total New Registrations for those vehicles. 4 Government 5-Star Safety Ratings are part of the National Highway Traffic Safety Administration’s (NHTSA’s) New Car Assessment Program (www.safercar.gov). 5 Insurance Institute for Highway Safety rating for 2016 Camry, vehicle class Midsize Moderately Priced Cars. For more details on 2016 Top Safety Pick Plus Awards, see www.iihs.org. Applies to Camry models when equipped with Pre-Collision System (PCS).